This Sunday is the feast of Mary, Mother of God. It is a title given to her from the earliest days of the Church and confirmed by the Council of Ephesus in 431 A.D. It reaffirms the role of Mary as the human mother of the fully human, yet fully divine Jesus. Today, we celebrate Mary's quiet "yes" to all of these things, which she accepted and kept in her heart. Our first reading (Numbers 6:22-27), we hear an ancient Priestly Blessing, often given as part of a religious worship. It is this blessing that has its ultimate fulfillment in the birth of Jesus. The LORD said to Moses: "Speak to Aaron and his sons and tell them: This is how you shall bless the Israelites. Say to them: The LORD bless you and keep you! The LORD let his face shine upon you, and be gracious to you! The LORD look upon you kindly and give you peace! So shall they invoke my name upon the Israelites, and I will bless them." In our Gospel reading (Luke 2:16-21), we hear the conclusion of Luke's account of Jesus' birth and the Shepherds' retelling of the angelic message they had received. It is a scene that emphasizes both the divinity and humanity of Jesus. The shepherds went in haste to Bethlehem and found Mary and Joseph, and the infant lying in the manger. When they saw this, they made known the message that had been told them about this child. All who heard it were amazed by what had been told them by the shepherds. And Mary kept all these things, reflecting on them in her heart. Then the shepherds returned, glorifying and praising God for all they had heard and seen, just as it had been told to them. In our Epistle reading (Galatians 4:4-7), St. Paul also underscores the humanity of Jesus (born of a woman) and his divinity (God sent his Son). He explains what this means to us as adopted sons (and daughters) of the Father. 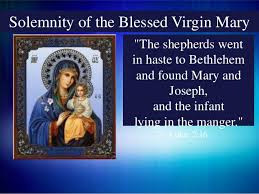 Brothers and sisters: When the fullness of time had come, God sent his Son, born of a woman, born under the law, to ransom those under the law, so that we might receive adoption as sons. As proof that you are sons, God sent the Spirit of his Son into our hearts, crying out, "Abba, Father!" So you are no longer a slave but a son, and if a son then also an heir, through God. What an awesome thing it is that one of our own, Mary, is chosen by God to bear his Son. It is fitting that we honor her above all other God's children.